Last week I published my first post featuring a financial software program. That post featured SpringCoin, an online debt relief coach. I’ve decided to keep reviewing more financial software to see if I can find something suitable for myself and my readers. This week I am featuring fairly new software which is still early in development. It’s showing some decent promise though. The name of this software is Planwise. 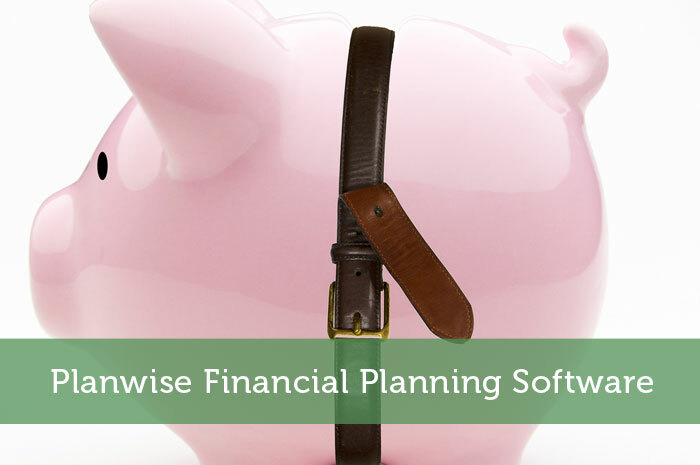 Basically Planwise is a simplified financial planning tool, designed to help assist with financial decisions. The great part is that it is both free and anonymous. So unlike many financial software programs, you don’t need to provide your social security number or banking details. I admit that for most financial bloggers it may be a bit too basic at this point in development. You’re not going to be able to enter your entire financial story and get detailed analysis. It seems to be aimed more at a younger audience with limited financial knowledge. Still, I thought it would be interesting to try it out to see how my expenses will fare until I land a new daytime job. This would give a good idea of how long I will be able to get by on just my side income. It was very easy to enter my approximate expenses and income with their user interface. Right away it produced a nice graph showing how my bank balance would gradually decrease over time. Of course this was all assuming my expenses and income would remain steady. Despite this assumption, it seems like a good way to plan things like this. As you get more things going on in your life, you can integrate multiple plans into their software to see the overall effect. How do you plan your finances for these kinds of situations? Have you used any software to help? This is pretty awesome! I wasn’t aware of their software until last night but I’m glad you reviewed them. Basic is sometimes good. Some of the complicated software really confuses people that don’t know what they’re doing and serves as a roadblock. So instead of them actually figuring it out they don’t even use it because it’s too complicated. That’s definitely true. Some financial planning software is quite complex which just discourages people with limited financial knowledge. There does need to be more basic options for people that don’t know a lot about managing their money. Agreed basic is very good for a newbie. If it is complex it will discourage them from getting started and learning. Yes those people have to start somewhere to learn the basics and get comfortable with planning their finances. Not everyone can jump into using complicated software. Like the other commentors, I agree that basic is great for beginners. Let’s get them started with something so as not to overwhelm them. Personally, for my planning I find that nothing beats the power and customizability Microsoft excel. I fully admit to being an excel nerd, lol. For sure, excel is very powerful. It isn’t very practical for financial beginners though. They wouldn’t know how to setup math formulas within their spreadsheets. Plus it really help to get a visual representation of your finances rather than strictly looking at the numbers. Even if Planwise is a bit too basic for most financial bloggers, it would certainly make sense for them to at least take a look at it. The software program is free and you don’t have to divulge your social security number. Those would be the most important selling points for me even if I was a financial blogger (which I;m not). That is true. Even basic software can be useful to advanced users. Perhaps you’d want to create some financial plans that you’d prefer to keep completely anonymous and not connected to your official budget. Or maybe you don’t currently use any financial software and want something to easily create some financial plans. Sounds like some really neat software. I’ve heard of them before but it was in the first stages of planning so I didn’t get to look at everything. I think being able to put your facts in anonymously will be a big draw for some people. Yes that is bound to be a very positive feature to have. I’m sure lots of people aren’t too comfortable providing banking details or social security numbers to other financial software. It sounds like PlanWise is still working at improving their software a lot. So I may feature it again later when the capabilities expand. They’ve been great working with so far. It’s awesome that they created a video for you! Sounds like the software is somewhat simplified which would be perfect for someone like me! The exclusive video was a big reason why I agreed to feature their software. I like to include some video content here and it’s nice to get some links back from the video on other sites. Sounds like a very helpful piece of software – particularly the fact you can try out different scenarios. I must admit the most I’ve ever done is add up our monthly expenses and checked they can still be covered if Mr Canuck Buck or I lose our jobs. At least you have done that much. I generally do very little financial planning. It’s definitely something I need to improve upon. I have never used any type of financial software, so I would actually prefer to start out with basic. I like that you don’t have to put a social security number in there. I have never tried mint because I don’t like the idea of giving them all of my account numbers. I might still try Mint and feature a review on here, but I do get paranoid about entering my bank account details. PlanWise seems like a good alternative for people who want something less intrusive and easier to understand. Hmm…maybe I’ll give this a go, my biggest beef with trying to plan for the future is that there are so many potential scenarios that could play out. I like that it’s anonymous too. Yeah I noticed you worrying about the multiple scenarios in one of your recent blog posts. I guess you just need multiple plans for whether things work out well or not.